Enjoy an evening in Crown King, tasting a variety of wines and microbrews, delicious appetizers and desserts. Raffle, silent auction and dancing under the stars! Join us for the 13th Annual Wine in the Pines in the tall pines of Crown King, Arizona! Enjoy an evening of fine wines, craft beers, food, desserts, silent auction, raffles & more. This year's culinary delights will feature Megan Knox's original creations. All proceeds will benefit the Crown King Volunteer Fire Department. Music is provided by our local Musicologist, Bob Cosburn with dancing & wonderful guests creating a magical night at the Crown King Saloon. Ticket price includes all tastings, food, souvenir glass and entry in door prize drawings. Additional raffle baskets & silent auction items will be on display and tickets available for purchase throughout the evening. We appreciate all the years of support for Wine in the Pines. Last year we raised over $9,300 for CKFD. Visit www.CrownKingAZ.com for directions, lodging, history and town directory. 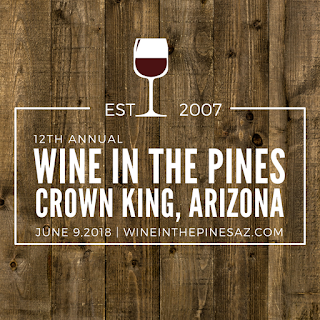 Join us for the 12th Annual Wine in the Pines in the tall pines of Crown King, Arizona! Enjoy an evening of fine wines, craft beers, food, desserts, silent auction, raffles & more. This year's culinary delights will feature Megan Knox's original delights. All proceeds will benefit the Crown King Volunteer Fire Department. Music is provided by our local Musicologist, Bob Cosburn with dancing & wonderful guests creating a magical night at the Crown King Saloon. Ticket price includes all tastings, food, souvenir glass and entry in door prize drawings. Additional raffle baskets & silent auction items will be on display and tickets available for purchase throughout the evening. We appreciate all the years of support for Wine in the Pines. Last year we raised over $6,000 for CKFD. Visit www.CrownKingAZ.com for directions, history and town directory. 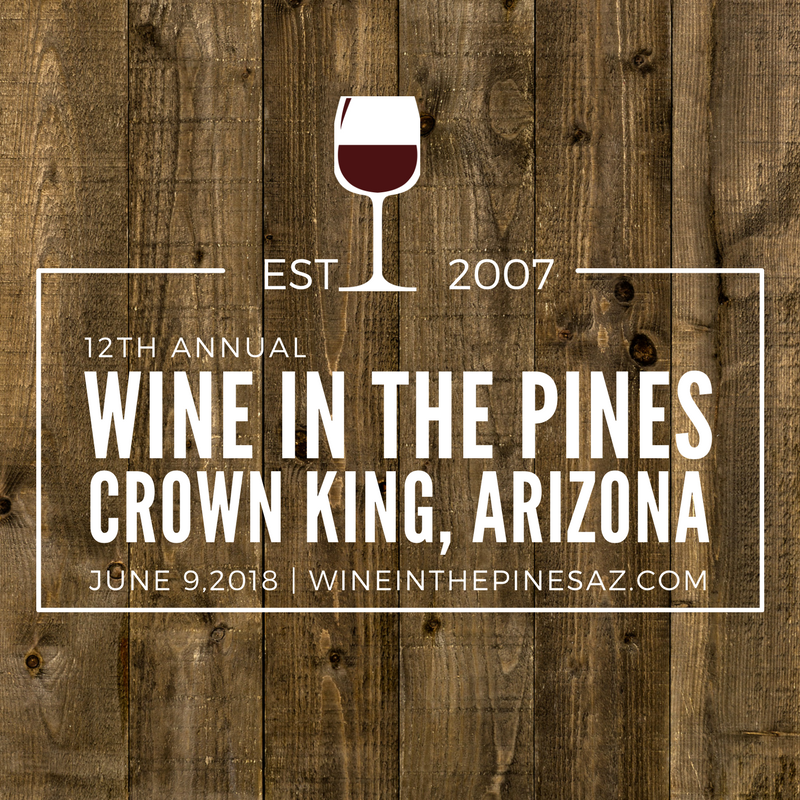 Join us for the 11th Annual Wine in the Pines in the tall pines of Crown King, Arizona! Enjoy an evening of fine wines, craft beers, food, desserts, silent auction, raffles & more. All proceeds will benefit the Crown King Volunteer Fire Department. Music, dancing & wonderful guests will help create a magical night at the Crown King Saloon. Ticket price includes all tastings, food, souvenir glass and entry in door prize drawings. Additional raffle items will be on display and tickets available for purchase throughout the evening. We look forward to seeing you at this year's event! Thanks for supporting the Crown King Volunteer Fire Department. Come join us in Crown King for our 10th Annual Wine in the Pines! Wine in the Pines offers a variety of wines and beers, paired with tasty appetizers and desserts. Great raffle prizes, silent auction and dancing under the stars! Ticket price includes all tasting, food, souvenir glass and entry in door prize drawings. Proceeds are donated to Child Crisis Arizona, along with a special auction to benefit the Crown King Fire Department. We look forward to seeing you at this year's event! Together we've raised over $36,500 for the Crisis Center since our first Wine in the Pines in 2007! 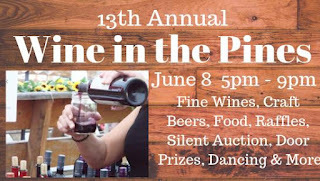 9th Annual Wine in the Pines is June 6th! Come up to the cool pines of Crown King for a night of drinking, dancing and fun at the Historic Saloon! For the 9th year, our Wine in the Pines event will benefit Child Crisis Center, a shelter for abused and neglected children, with a special fundraiser for CK's Volunteer Fire Dept. Wine in the Pines offers a variety of wines and beers, paired with tasty appetizers from G&S Catering, El Bravo Mexican Food, plus tempting desserts from Doozy's Bakery. Enjoy Musicologist, Bob Cosburn, playing music for just about everyone's taste for your dining, dancing and wine tasting pleasure. Ticket price includes all tastings, food, souvenir glass and entry in door prize drawings. Additional raffle items will be on display and tickets available for purchase throughout the evening. Proceeds from the evening are donated to Child Crisis Center, along with a special auction to benefit the Crown King Fire Department. A huge THANK YOU to all of our friends, sponsors and volunteers for making Wine in the Pines a continued success! 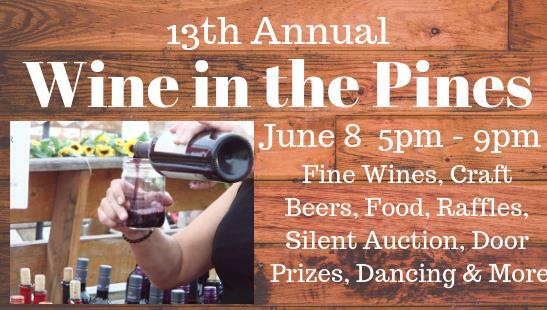 8th Annual Wine in the Pines is June 7th! For the 8th year, our Wine in the Pines event will benefit Child Crisis Center, a shelter for abused and neglected children, with a special fundraiser for CK's Volunteer Fire Dept. Wine in the Pines offers a variety of wines and beers, paired with tasty appetizers from G&S Catering, plus tempting desserts from The Melting Pot. Enjoy live music performed by crowd-pleasing band The Cover Ups! A huge THANK YOU to all of our sponsors for donations of raffle items and silent auction gifts! We appreciate your support! Come up to the cool pines of Crown King for a night of drinking, dancing and fun! For the 7th year, our Wine in the Pines event will benefit Child Crisis Center, a shelter for abused and neglected children. Wine in the Pines offers a variety of wines and beers, The Mill's signature appetizers, paired with tasty desserts and ice cream for a cool treat! Take in the beautiful views from The Mill Restaurant's indoor-outdoor terraced beer garden, featuring a 3-cylinder diesel engine used to power mining operations. Enjoy live music performed crowd-pleasing band "The Cover Ups" on the open-air stage. Ticket price includes all tastings, souvenir glass and entry in door prize drawings. Additional raffle items will be on display and tickets available for purchase throughout the evening. Proceeds from the evening are donated to Child Crisis Center, along with a special auction to benefit the Crown King Fire Department.